UCI Alumni Association has raised $ 7,419 from 161 gifts! Help Raise Our Ranking and Beat UCSB! How, you ask? Good question. Today, we ask EVERY ANTEATER ALUM to donate to UCI. The amount you give doesn’t matter. It only matters that you give. Let’s beat UCSB and take over the #8 spot – or higher. The UCI Alumni Association endowed scholarship fund supports the best and brightest students at UCI. Each year, more than $100,000 is awarded to UCI students through the UCI Alumni Association. By giving today, your contribution will make a life-long impact on students who truly are making a difference in their local and global communities. As UCI improves its alumni participation rate, the university attracts even more high-quality students; continues to recruit outstanding faculty; and improves its world-class research, all while increasing the value of your degree. Now for some fun. 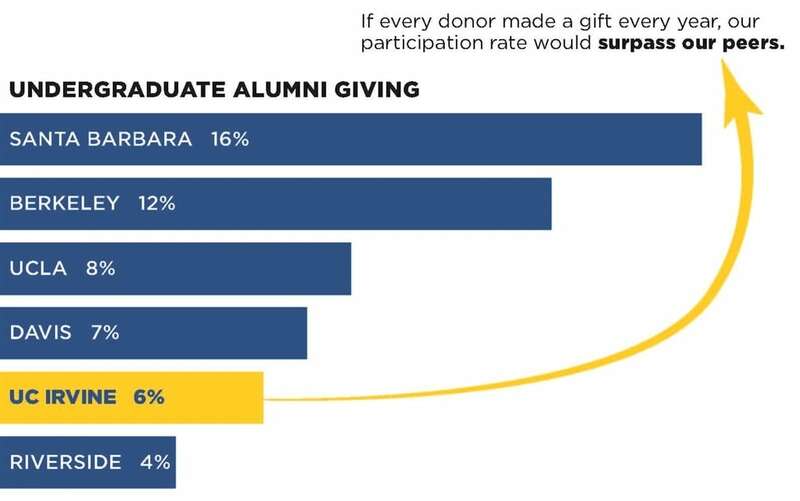 In the spirit of #RaiseOurRank, we challenged our chapters to see which one can get the most donors on UCI Giving Day. The below chapters have accepted the challenge and are ready to compete for the title of the “Most Engaged Alumni". Click on the chapter you want to support and select “GIVE” on their page. Giving just $1 counts! The more donors, the higher of the ranking of your chapter on our leader board. Show your UCI Pride! Check out our full list of UCI Alumni Chapters at http://alumni.uci.edu/engage/chapters.php.